Today we are releasing an update to the Blink App (available in the Windows Phone store). The update includes a variety of bug fixes and a major new capability. Blink now automatically removes noise from low-light captures. As pointed out in previous posts Blink has always featured an advanced stabilization algorithm. This algorithm makes a hand-held capture look as if it was captured from a stable tripod. Once an image sequence is stabilized we may still see some frame to frame differences in the form of image noise, this is especially apparent in low light conditions. An example of this is the left hand GIF below captured with the previous version of Blink, notice the noise (aka grain) visible in the sequence. The right hand GIF is what the new version of Blink will automatically produce. Notice the almost complete removal of noise in the still regions while maintaining crisp motion in the moving regions. Several more examples are available on the Blink site. This noise removal was achieved by a new algorithm that runs after stabilization. Blink automatically analyzes the motion in the scene. Where the motion can be stabilized the algorithm effectively performs a very long exposure by merging the entire Blink sequence, where the motion can’t be stabilized the sequence is left untouched. One way to think of this is optical image stabilization on a region by region basis. Instead of simply stabilizing the entire frame and blurring moving objects, Blink performs the merge selectively. For those interested in the deep details of this technique, it will be presented at the SIGGRAPH Asia conference in December. In the meantime give it a try on your Windows Phones. We are excited to announce the latest update to Image Watch (Version 1.5). 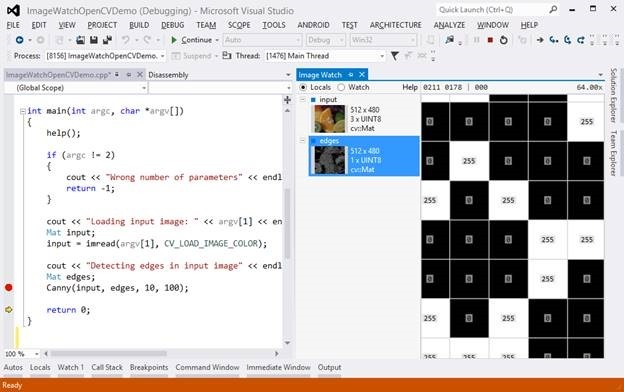 Image Watch is our Visual Studio plug-in for debugging C++ image processing applications. It adds a new control to Visual Studio that displays images in memory as you step through your code in the debugger. Inspecting an in-memory edge image (at 64x magnification) while debugging. The latest update includes a number of bug fixes and new features inspired by user feedback in the Image Watch Q&A. For example, pixel values are now shown as text on the pixels themselves when zoomed in all the way (see screenshot). We also added support for visualizing custom bit depth integer formats and 16bit float format. The complete list of changes can be found in our release notes. We are excited to announce the latest update (version 2.2) to the BLINK app for Windows Phone 8. You can get the app for windows phone from here. Since BLINK captures frames both before and after the user triggers the capture, one of the issues in the previous version was that users could potentially get a focus sweep in the captured. This could lead to the sequence having a few blurry frames. With the latest version, we added a new feature that does continuous auto-focus – we automatically refocus whenever required. Focus is triggered based on a few different criteria. 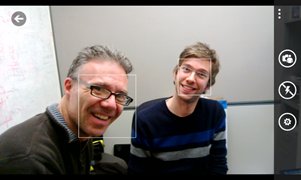 We now have a fast face tracker running on the phone that is continuously monitoring the preview feed. If we find a suitable face(s) we focus on the face, as the people are presumably the subject of the photograph. We also monitor the phone’s orientation and movement continuously through the phone’s motion sensors and monitor image statistics to see how much the image in view is changing. If no faces are present, a focus is triggered once a reasonable movement of the phone is detected or the statistics of the scene have changed appreciably. We do also retain the ability to manually trigger the autofocus mechanism through the half-press of the dedicated camera button and release, which the user can use if needed. One of the important aspects of BLINK is the image alignment algorithm that runs right after a capture and stabilizes the frames in the sequence. This has the useful effect of minimizing frame-to-frame changes that could occur from hand shake or other jitter while capturing. The frame-to-frame difference are not noticeable when viewing an individual frame, but can be readily seen as the user scans through the sequence by moving the frame picker or while playing the sequence. In BLINK the stabilization algorithm removes distracting hand shake motion and helps users see the more important changes from frame to frame. With the new update we have significant improvements to the stabilization algorithm. The stabilizer runs by identifying salient image features in each frame and tracking them through the sequence. We now have improved the stabilizer to (a) choose a better subset of features (b) use a more representative model for the change between frames. As a result we get really good stabilization as you can see in the sequence below. This is a hand held sequence playing back and forth but can you see any motion? 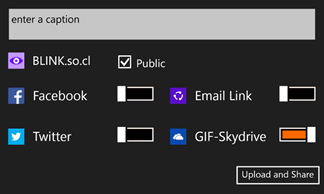 Once of the highly requested features by users of BLINK is the ability to encode and share the BLINK sequences in the highly popular GIF format We listened, and with this update users will be able to select Skydrive as one of their share destinations and the BLINK sequence will be encoded to a GIF and uploaded to Skydrive. Once on Skydrive, the user can view the GIFs playing through Skydrive’s web viewer or can download the GIF for other uses. With the new update we also added image metadata encoding in the images that are saved via BLINK. Users will now find the date, time and the location information in the EXIF data (image properties) of the images that they saved through BLINK to the phone camera roll. Users can then use this information for sorting and other purposes. Based on feedback from many collaborators, we are providing a few updates to the previously released JPEGXR software. In this post we are also providing an analysis comparing our JPEGXR implementation to WebP. In the jxrlib GIT https://jxrlib.codeplex.com/releases, version 1.1 is now available. This release implements a slightly refined encoder quality. This means that setting the 0 – 100 quality value in the encoder library now translates to different encoder parameters, which should, in most cases, result in improved perceived image quality. The update also includes several community-contributed extensions to perform pixel format conversions. The Photoshop plugins for Windows and Mac have also been updated. The new plugin includes the refined encoder quality implementation and an improved handling of Photoshop alpha layers. Using our 1.1 JPEGXR encoder, we performed an analysis of JPEGXR with the same methodology as the WebP vs. libjpeg study done by Google (https://developers.google.com/speed/webp/docs/webp_study#exp2). In our analysis we use the same images as in the Google study and encode them via JPEGXR, WebP, and Photoshop’s “Save for Web” JPEG encoder. For each encoder we sweep through 10 quality values* and plot the rate distortion curves (bits per pixel vs. SSIM)**. In these graphs there are several interesting things to point out. JPEGXR outperforms WebP in the high end of the quality range and equals or marginally beats WebP in the low end of the quality range. Both WebP and JPEGXR handily outperform JPEG at low-quality settings. WebP does not outperform JPEG at high-quality settings (Photoshop quality slider set to 80 or above), while JPEGXR does. In each of the graphs, I have labeled what Photoshop has implemented as quality “50” and quality “0” (on a scale of 0-100). Much of the Google analysis reports on quality below “50.” I don’t know how many photos are saved out of tools like Photoshop at such low quality, but I would guess not many. 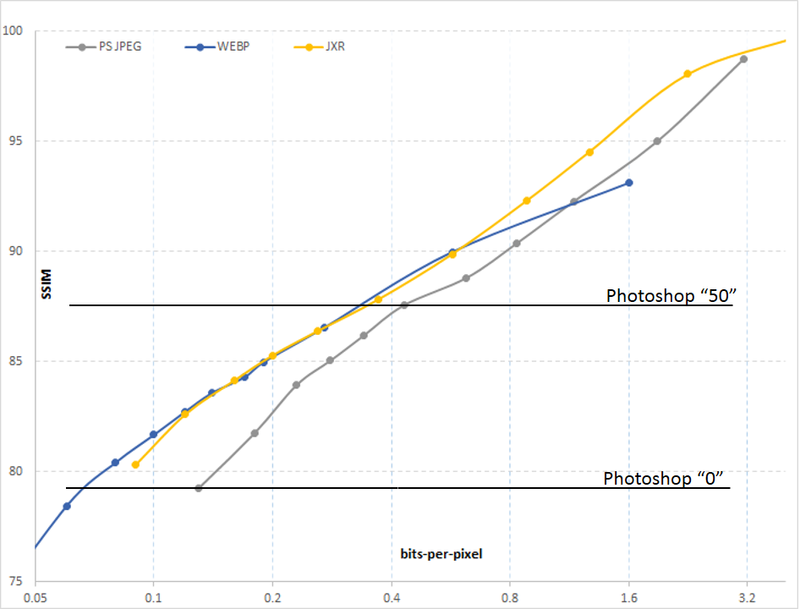 In the above “50” portion of the quality range, our JPEGXR implementation clearly outperforms WebP. 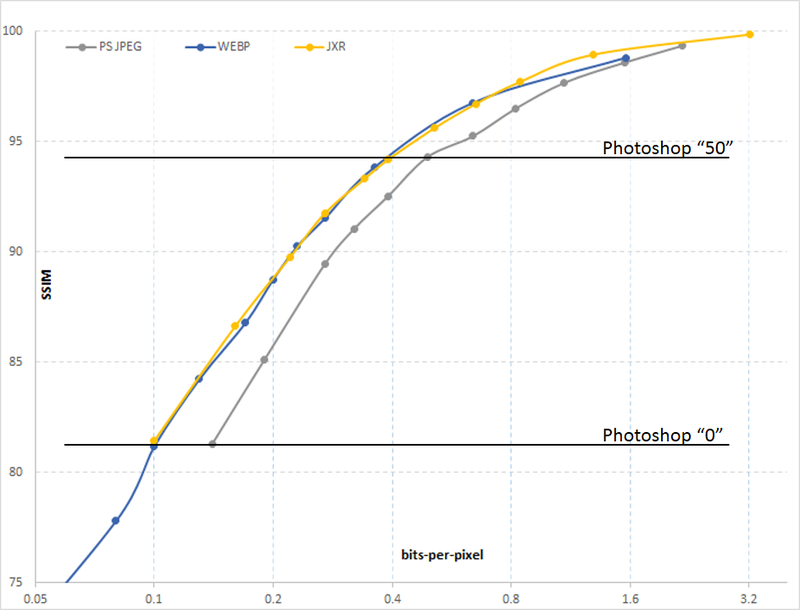 Since the last blog post, we’ve been asked several times how JPEGXR compares to WebP. So we are providing the above rate-distortion curves. Of course, this is only one factor, albeit a very important one, to consider. As pointed out in the last post, JPEGXR has many other interesting features, such as continuous quality from lossless to lossy, alpha channels, HDR, and compressed domain operations. And JPEGXR is an international standard — many of these features are not currently applicable to WebP. An open source library (BSD license) is available at our JPEG XR GIT. JPEG XR is an approved ISO/IEC International standard (its official designation is ISO/IEC 29199-2). See more information in the press release from the JPEG Committee. JPEG XR started its life in Microsoft Research. It publicly first appeared as the HD Photo format, 7 years ago in Windows Vista. Microsoft submitted HD Photo to the JPEG committee and it emerged 2 years later as a new standard. Thanks to the excellent work by the committee, the standardization process resulted in several changes to the original specification. This robust peer review has led to a better product for end users (compared with one entity defining a new format). JPEG XR support is included in many Microsoft products, most importantly Windows 7, Windows 8, and IE10. For web developers, JPEG XR has a large number of interesting features, see the table below. Some of these are big advantages over other image formats like JPEG, PNG, OpenEXR, and TIFF. On average the file size will be 40% smaller than JPEG for similar quality. In addition the compression artifacts in XR are less objectionable than JPEG so there is often more file size savings available. Lossless Mode The lossless mode in XR achieves better compression than PNG (especially for natural images). Alpha Channel XR supports an alpha channel, unlike JPEG. PNG does support alpha, but, unlike PNG, XR has the capability to compress color lossy and alpha losslessly. This capability results in much smaller file sizes. Extended Bitdepth XR supports 8-, 16-, and 32-bit/channel, this means that it can store either RAW images or HDR images without losing precision. This coupled with sophisticated compression achieves smaller file sizes than other formats like TIFF, RAW, or OpenEXR. Progressive Decode IE10 leverages the XR progressive download mode. XR images can be cropped, rotated, flipped, and resized all in the compressed domain. The tile-based layout of an XR file allows for efficient region-of-interest access. I’ll end with two simple demonstrations of how XR compares with JPEG. I compressed the picture above using both our Photoshop plugin and Photoshop “Save for Web & Devices …” In each case I set the quality to a fairly low ‘20’ setting. Note that we have tuned the JPEG XR plugin quality sliders to match Photoshop’s JPEG encoder quality slider. This means that for a given setting you should get a comparable ‘quality’ but the JXR file size will always be smaller. In this case the original 32MB uncompressed image compressed to a 703KB JPEG file and a 453KB JXR file (36% savings). Zooming in on an area of the ear we also see that the types of compression artifacts present in the JXR are less apparent than the familiar “blocking” artifacts of JPEG (the rightmost slice is the original). For this same image, I plot a sweep of the quality slider from 100 to 0 for both JPEG and JPEG XR. The X axis is PSNR (a measure of quality) and the Y axis is the amount of compression. 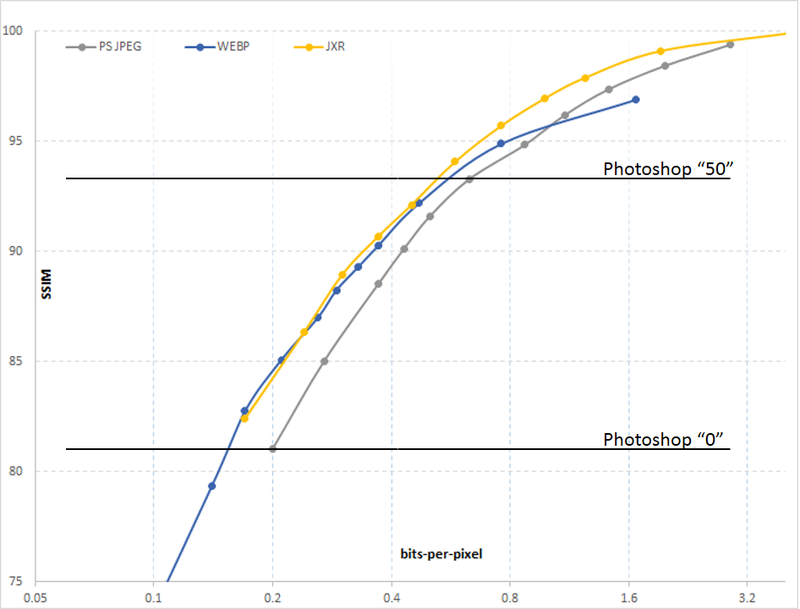 Several things to point out here – (1) JPEG XR consistently achieves higher compression (smaller files), and (2) notice the extreme right side of the graph; JPEG XR can achieve higher quality than JPEG. In fact, the quality slider represents a continuous scale of lossless compression at ‘100’ to progressively more lossy. This post gives a very quick introduction to JPEG XR. For those who want to learn more, I encourage you to start with the Wikipedia page, and Bill Crow’s blog. Also, please do give us feedback on our new source code and Photoshop plugin releases in the comments below. I was just trying out the new panorama feature built in to iOS6 (available on the iPhone 4S and 5). The resulting panoramas look great, but one thing that I miss compared with Photosynth is the ability to view the result as a true “surround” experience. I was curious if I could work out the geometry of the iOS panoramas so that they could be uploaded to http://photosynth.net, and then be available to view anywhere–on the web or in the Photosynth App. The quick answer is yes. You need to get the Photosynth Export Plug-in for Photoshop. When you run the plug-in, select “Cylindrical (Horizontal)” from the “Projection” menu, and determine the “Field of View” of your panorama by taking the width of the image and dividing it by the magic number 53.5. Here are two panoramas that I uploaded using this technique: Seattle 12th Street Bridge and Seattle Yesler Bridge. If any readers try this out, please send us a link to the result via the comments or on Twitter. That’s it. But, if you want to know where 53.5 comes from, continue reading. The figure below shows the iPhone sweeping out a panorama. I’m assuming that iOS reads the pixels from the camera and “projects” them onto a cylinder in order to form the panorama. The cylinder is represented as the blue path in the figure. The length of this path is equivalent to the width in pixels of the panorama that was captured. I haven’t yet found the sensor size and focal length of the iPhone 5, so 53.5 may not be the right number for that phone. Post a comment if you know. 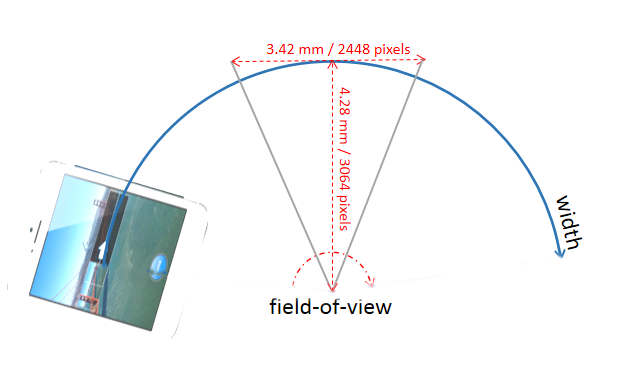 I also think that a very similar calculation could be done for the Sony cameras with the sweep panorama feature. Last week the Windows Live Essentials team announced the release of the Microsoft Camera Codec Pack. The announcement focused on how the codec pack enables Photo Gallery and Windows Explorer to view RAW images. What wasn’t mentioned is that it also allows any other Windows application to open RAW files. This is important for Image Composite Editor users as there is now a high-quality and free method of importing RAW images into ICE. I emphasize high-quality and free because ICE has in fact supported RAW images since last year, when I blogged about it. RAW support in Windows, and thus ICE, was available via a “plug-in.” Windows allows any third-party software vendor to extend which image types are supported in the operating system. Based on my own observations of ICE users, the “plug-in” strategy confused many. One source of these plug-ins is the camera manufacturers, like Canon and Nikon. Unfortunately, they mostly do such a poor job developing and supporting their software that it made Windows, and other applications that relied on it, look bad. We have updated our codecs page to reflect this and strongly discourage anyone from installing the Canon or Nikon software. Another source is vendors who sell high-quality and well-supported plug-ins that cost $15 and up. However, many of our users felt that they shouldn’t need to pay for a feature that they expect to be built into a modern operating system. Mostly though, users simply assumed RAW wasn’t supported in Windows. Judging by the reaction from tech journalists (see “Windows Finally Gets RAW Image Support” 1, 2, 3) this notion was pretty widespread. We have updated the WIC Codecs for Image Composite Editor page and added the new Microsoft codec pack to our recommended list. We also still recommend Fast Picture Viewer (FPV) for RAW files that aren’t supported by the Microsoft codec pack. Additionally, FPV is recommended if you have a need to use less common file formats, such as HDR and OpenEXR, in ICE. The new Microsoft codec pack is available here: http://www.microsoft.com/download/en/details.aspx?id=26829. There is some great technology built in. The Windows Live team has built a sophisticated lab for characterizing cameras to ensure high-quality output from the RAW decoding process, and the RAW codec is built to take advantage of multi-core PCs, so it should be very fast.